Turf 10 is a locally owned and operated professional turf care and consulting business operating primarily in the near west Chicago suburban area. With nearly 40 years of turf experience and over 50,000 lawns serviced over that time, Turf 10 specializes in turf care programs for residential properties. As an owner – operated business, you are assured the personal attention that comes with familiarity – the same turf tech on your property, every time, every year. Our objective is to provide premium quality products, top level customer service, and a lawn we can both be proud of – all built on solid word of mouth referrals – no door to door soliciting, no telemarketing, and no mass market advertising. After four decades in the business, we know what works for our valued customers! Our standard 6 application turf care program is the basis for a healthy lawn. Upon evaluation, we can custom shape your program based on your properties characteristics – soil texture, thatch layer, shade, watering and mowing habits etc. 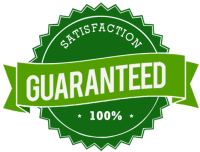 We realize that the weather plays a significant factor in results, therefore all service recalls are free, and results are guaranteed.